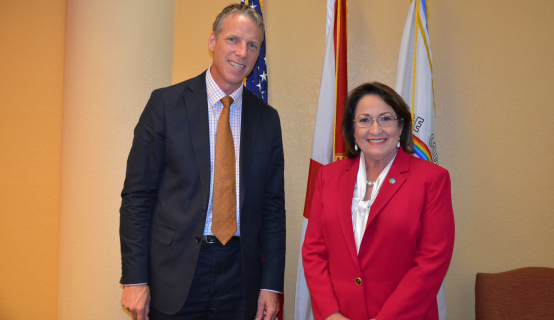 Orange County Mayor Teresa Jacobs recently met with the Honorable David Prodger, British Consul General in Miami, to discuss business, tourism and economic opportunities between the United Kingdom and Orange County. Great Britain is the largest foreign investor in Florida, with 43,100 jobs created as a direct result of investments by British companies. Consul Prodger said nearly 800,000 guests from Great Britain visit the region annually. Mayor Jacobs discussed the possibility of bringing the new regional branding initiative – “Orlando. You don’t know the half of it.” – to the UK. The initiative is designed to boost awareness of Central Florida’s businesses and innovation assets among targeted industry leaders and site selectors to encourage economic development and job creation. Consul Prodger praised Orange County’s economic successes, including Lake Nona’s Medical City and the modeling, simulation and training industries. Mayor Jacobs and Consul Prodger attended the grand opening of the I-Drive 360 complex, which is owned by the British company Merlin Entertainments. I-Drive 360 is additionally anchored by the world-famous Madame Tussaud’s, an immersive and interactive wax experience—SEA LIFE Orlando Aquarium, which features a 360-degree ocean tunnel and more than 5,000 creatures, and the unique Skeletons: Animals Unveiled! Experience, which features the skeletons of 400 different species. Accompanying the entertainment experiences, visitors can enjoy a diverse array of dining and nightlife options such as Yard House, Tin Roof, Sugar Factory and more.